In the constantly churning pool of Republican Presidential candidates, a seemingly political newcomer has risen to the top (for now): Herman Cain. Mr. Cain, the former CEO of Godfather’s Pizza where he engineered a leveraged buy-out from Pillsbury, isn’t really a political newcomer or outsider, though. He only appears to be because he personally has never won an election despite several attempts. (see Wikipedia biography). In fact, he’s been a campaign insider and advisor for many Republican candidates going back to at least Bob Dole in 1996. He also played a key role in defeating President Clinton’s attempts to reform healthcare in the 1990’s. Herman Cain has risen to the top (some recent polls show him essentially tied with Mitt Romney) largely because of his “9-9-9” tax plan. So what’s it all about and what are the likely consequences? Let’s explore what the plan is first. I will summarize here. A more in-depth analysis (pdf) is available from the Tax Policy Center. The Cain campaign’s page on the plan is here. Cain is proposing to eliminate the existing corporate income tax and payroll taxes. I assume that this includes eliminating the Social Security tax and Medicare taxes, although the Cain campaign avoids saying that clearly by referring only to “payroll taxes”. He then proposes to radically reform the existing individual income tax system and adding two new taxes. The result is that the existing triad of corporate income tax, payroll tax, and individual taxes is replaced by a triad of three taxes which each have a 9% tax rate, hence the name for the plan. Change existing Individual income tax system – charge a flat 9% on gross income with the only deduction allowed being for charitable contributions. Home mortgage interest deduction is gone. Personal exemptions are gone. This means a single person with no dependents and $50,000 income pays $4,500 (9%), the same exact amount as a family of four with two small children and a $50,000 income. It is unclear whether deductions for the expense of earning income are allowed or not such as sales representative deducting business expenses. I presume they are not. Only earned income from employment is taxed, not dividend income. It is unclear whether Cain would tax pension income or Social Security benefits. He doesn’t clarify those. My guess is they would be taxed. A new national sales tax of 9% on everything. Although most states currently exempt food and other essentials from sales tax, Cain does not. Plan to add 9% to whatever you buy. The consumer pays the sales tax directly at the time of purchase. A new national business tax of 9%. This is a modified form of value-added tax (VAT) commonly called a business transfer tax. It essentially means that all businesses pay a 9% tax on everything they sell minus a deduction for whatever purchases they have made, not counting purchases of labor. I find the enthusiasm among Republicans for this part for the tax kind of strange. The state of Michigan had a similar business transfer tax called the Michigan Business Tax (MBT) in recent years and it was the #1 target of Republicans to repeal when they came into office. The MBT was absolutely hated. That makes me skeptical that Cain either could actually get a a national business tax or that it would survive for longer than a year or so. I expect that in implementation, the national business tax would soon be eliminated in favor of a higher individual income tax and/or higher sales tax and/or larger deficit. A business transfer tax like Cain’s proposed national business tax requires significant accounting and record-keeping. Businesses would no doubt attack such a tax as a “heavy regulatory and reporting burden”. Overall, estimates of the immediate effect of the 9-9-9 plan on tax revenues to the government show it would be largely neutral. That is, the plan, when applied to today’s economy this year, should produce approximately the same revenue as today’s tax system produces. In that sense, the plan represents neither a tax cut nor a tax increase in the overall macro sense. At the individual level, though, it’s a different story. 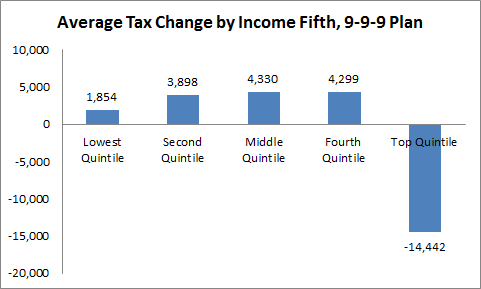 The 9-9-9 plan is either a really heavy tax increase or a really huge tax cut depending upon how high your income is. Now what about the top 20%? They come out ahead. The average household in the top 20% gets a $14,442 tax cut. If you’re not one of these fortunate rich people to get this large tax cut from the 9-9-9 plan, remember Herman Cain says it’s your fault you’re not rich. But we haven’t really looked at the impact on the top 1% or the top 0.1%, the really, really rich folks, the Wall Street CEO’s and big hedge fund managers, the ones who have gotten large bonuses in recent years paid for by government bank bailouts. The top 1% (which includes Herman Cain himself) will save on average $238,422 in taxes. The top 0.1%, the 150 thousand or so households that are really, really rich and powerful, will get even more. They will see an average cut of $1,356,078 in their taxes. I also have a properly scaled graph to show this too, but it’s only after the jump for formatting reasons. So click and take a look to see what Herman Cain calls making the tax system more fair. It should add fuel to the Occupy Wall Street fires. ← What’s the 99%, the 1%, and the 53% All About? I favor eliminating both business and personal federal income tax. I favor keeping the payroll tax which funds Social Security, and putting the revenues from this tax and the liabilities of Social Security into a separate budget, which must balance over the long term. I believe that an average payroll tax of 11%, organized to progressively increase from 2.5% on wages less than 33% of average household income to 50% of wages more than 4 times average household income. As current, the tax would be paid by the employee and equally by his employer. This system would replace unemployment, welfare, etc, because benefits would begin after 6 years national service or 40 quarters at 33% of national household income and progress to 75% of national household income for those with 120 quarters of covered employment or 80 quarters and national service. This system would provide enough income to replace most pension schemes. All imports would be zero rated, that is brought into the country at a tax value of zero, so the tax is due on the entire amount of the invoice, including transport costs. I also favor a $100 / BOE fossil fuels tax to fund transport infrastructure, and power infrastructure and to bring the true cost of these fuels into the market price.